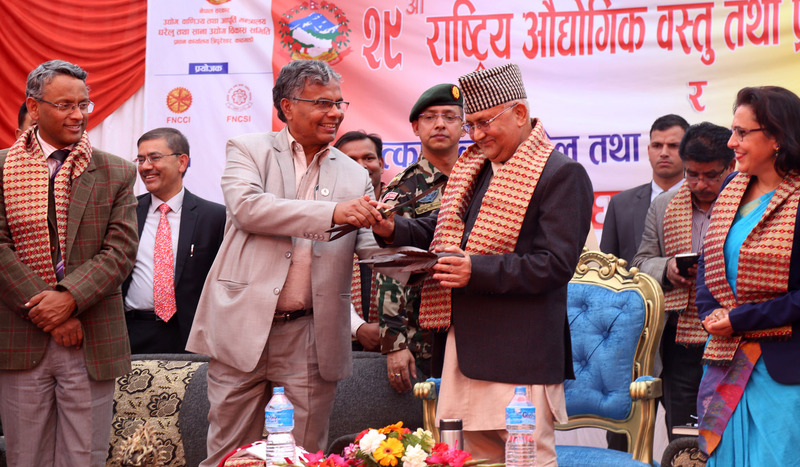 PM Oli pledges to put all-out efforts for positive change - Integration Through Media ....! KATHMANDU: Prime Minister KP Sharma Oli has pledged to put all-out efforts to materialize the campaign for positive change. “No stones will remain unturned for prosperity”, Prime Minister Oli said while inaugurating the 29th national industrial goods and technology expo. Vowing to lay emphasis on small and domestic industry sector for generating maximum employment opportunities, he added, “I am wholeheartedly committed to build the country. Our team is effortful to that end”. He noted that the government would address the challenges and opportunities created in the new governance context. He claimed that the train and ship service will be run in Nepal within a couple of years. The Prime Minister also assured that the government would work to boost the confidence of industrialists and business community and pledged to promote industry and entrepreneurship in the country. Also speaking on the occasion, Minister for Industry, Commerce and Supply Matrika Prasad Yadav also expressed the confidence that the government would address the challenges being faced by the industrial sector. Industry Secretary Yam Kumari Khatiwada stressed the need of the development, promotion and protection of local labour based competitive small and cottage industries. The industry fraternity urged the government to promote the use of goods manufactured by domestic industries.